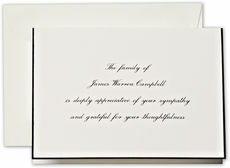 For elegance and poise in the greatest time of need. 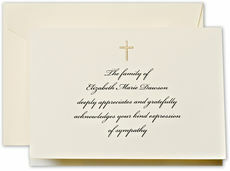 A simple gold cross make this expression of gratitude timeless and classic. Size 5.3125" x 3.8125". The same thin weight as our fine..
For elegance and poise in the greatest time of need. 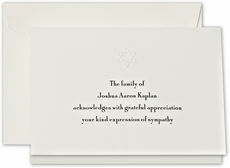 Simple and stately type and a blind embossed Star of David make this expression of gratitude timeless and classic. Size 5.3125" x..
For elegance and poise in the greatest time of need. 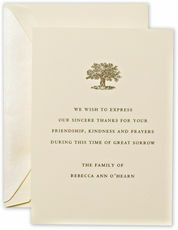 A simple black hand border make this expression of gratitude timeless and classic. Size 5.3125" x 3.8125". The same thin weight as our..